Peach Cobbler has been around for several years but I’m just now getting around to burning one to review. 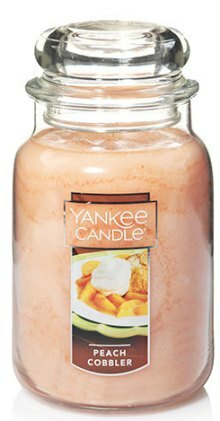 I’m usually not a huge fan of peach fragrances but Peach Cobbler smelled pretty delicious and I couldn’t resist. I detected sweet peaches and sugar blended with a warm bakery. Mmmm!! Very cozy and 100% edible. Peaches, from the farmer’s market, perfectly baked with cinnamon and honey sugar. Yum!! I could totally detect sugary peaches smothered in sweet vanilla cream. Absolutely! The cinnamon, honey and nutmeg? Not so sure I smelled those elements but maybe they will come to life once the candle is burning. If they do, I’ll be perfectly fine with that. Yankee candles tend to be lightly scented for me so I usually stick to small rooms and in this case, I chose a small powder room to test this candle in. Once lit, it took a good 30 minutes to really start noticing the scent and when I did…. oh my!! YUM!!!! This fragrance was in one word… amazing!! It smelled exactly as the description implies. Sweet delicious peaches and creamy vanilla wrapped in a light bakery crust. YUM!!! Seriously yum!! The best part… this candle gave a really great scent throw. It fragranced my small bathroom with ease and was even spilling out of the room which is rare for this brand. Loved it!! Strength – on a scale of 1 to 10, I would rate this candle a 7 in a small room. 5 in medium room. Large room… I wouldn’t even try and if you do, go for their scented tarts. My candle burned pretty good. It took hours to reach a full melt pool with each lighting but it eventually did with a teeny bit of help with a wick dipper. I did have to keep on top of trimming the wick each day but that’s pretty normal maintenance with this brand. I loved this Peach Cobbler form start to finish and am already itching to buy another candle in this scent. I liked it THAT much!! 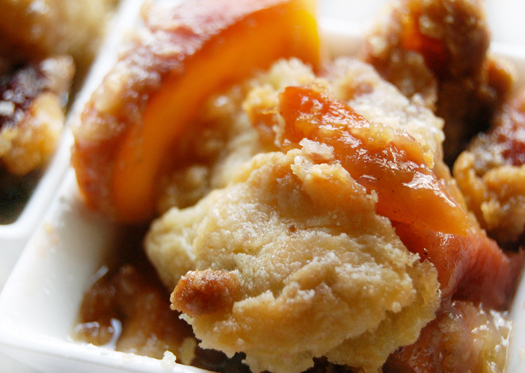 Just imagine sweet and sugary peaches drenched in vanilla atop a light bed of bakery crust. YUMORAMA!!!!! If I could have eaten this candle, I would have. Yankee got this one right on the money. Highly recommend this candle and bonus… it gave a nice scent throw. Yay!! As spot on as I believe Christina’s review is of the Peach Cobler from Yankee Candle, I will never give this company another dime of my money. Yes I may be missing out on those few candles here and there by Yankee that still have a great smell and scent throw, but to give these new owners of Yankee another cent of my money is not going to happen. I know I’m not the only one who used to be a huge Yankee fan only to find one day a majority of the candles didn’t smell the same? I’m sure like many others over recent years I have spent hundreds of dollars trying to find that Yankee candle, and scent I remembered to no avail. Unfortunately greed has overtaken common sense with the new owners of Yankee. They have obviously severely cut corners on the amount of fragrance they are adding to there candles. They forgot the great company they bought was built by giving customers what they wanted which was a product that was simply amazing. It’s really sad, and unless you have ever smelled the original Yankee candles you truely don’t know what I’m talking about or what your missing. R.I.P. Yankee Candlee as your no longer who I remembered. As far as Christina from Candlefind goes I cannot thank you enough. Since finding your site I have found so many wonderful candles. Your recommendation of Madison Valley Candles, Pure Integrity, and so many others have been amazing. Personally I feel like Madison Valley & Pure Integrity are the new Yankee candles of the candle industry, and probably better. It’s nice having this site as a guide, and no longer wasting good money on so, so candles. Thanks Chris……. Thanks Brad for your comments. I hear you with Yankee. I basically continue to review them because they still are a very popular brand and we’re all about candles… even the big guys. 🙂 I love Madison Valley and Pure Integrity too. Very much!! Glad you are loving them as well.